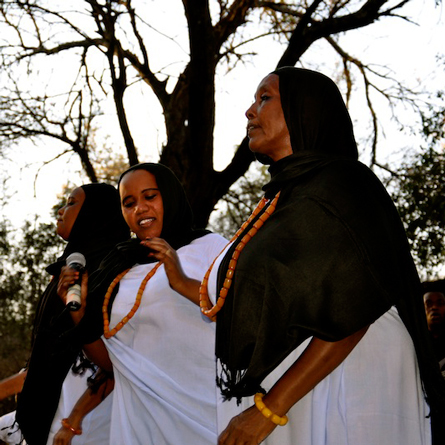 Gargar (formerly known as Bismillahi Gargar) is a group made up of Kenyan women of Somali origin from Garissa, North Eastern Kenya.The group’s name is derived from the Somali word ‘Gargar’ meaning ‘joining together’. 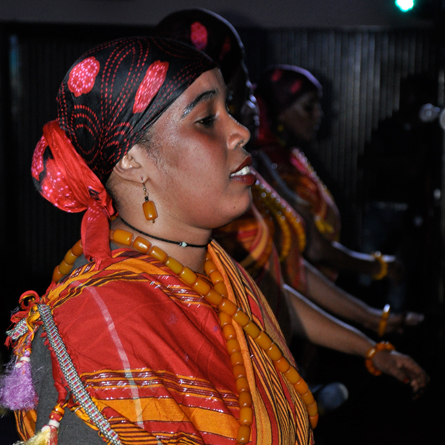 Gargar is part of the larger women’s self empowerment group from Garissa, called Bismillahi Gargar which was formed in 2003 with the purpose of reminding people of their traditional culture, and empower women in the community through music, basketry and weaving and other economical activities. 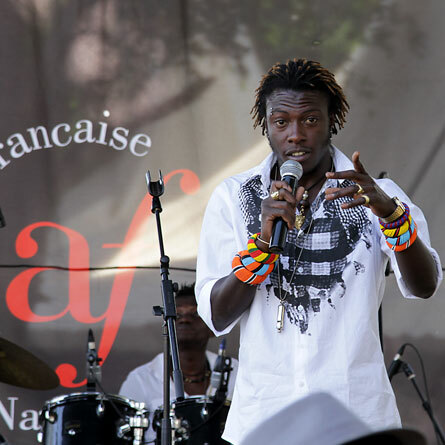 Gargar came to the limelight in 2008, as one of the 11 finalists in the Spotlight on Kenyan Music programme. Their AIDS awarness song titled ‘Aids Wadila’ (Aids Kills) was featured in the Spotlight on Kenyan Music Vol 4 compilation CD released in the same year. In 2010, Gargar released their debut 10 track CD aptly titled: Garissa Express which was recorded and produced at Ketebul Music Studios over a two year period that saw the ladies shuttling back and forth between Garissa and Nairobi. Their music features songs that are uniquely traditional and in keeping with Somali language and sounds, yet arranged and recorded with modern instrumentation and arrangements to keep it relevant to the present day. Since the launch of Garissa Express CD, the profile of this once marginalized group has been elevated transforming Gargar into one of the most sought after bands in the East African festivals circuit. The ladies have maintained a busy schedule that has seen them perform at festivals and shows in Zanzibar, Dar es Salaam, Harare, Bulawayo, Johannesburg and Nairobi. 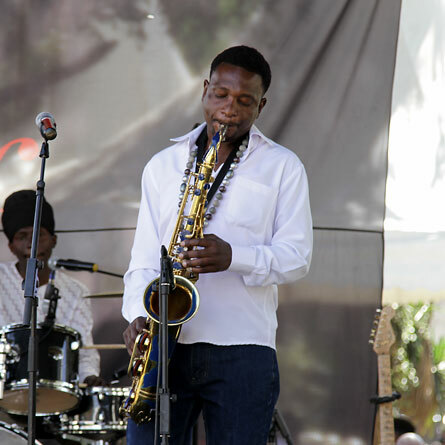 In 2011, Gargar reached another milestone in their career when they were nominated as the Best Group in the Afro Fusion category at the premier East African Music Awards. 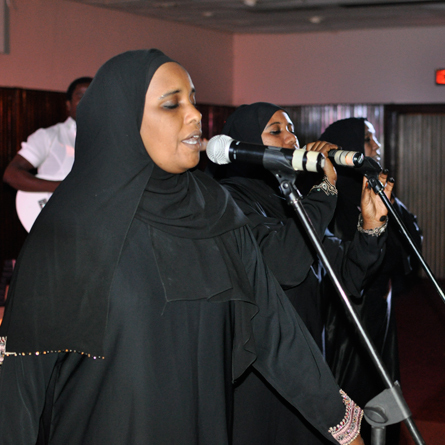 The following year in 2012, yet another of their songs from their Garissa Express CD titled Shicir was selected and featured in the Spotlight On Kenyan Music Vol 5 compilation CD that focused on music from Northern Kenya. The Spotlight on Kenyan Music Programme marked its 10 year anniversary with a colourful concert held at the Kenyatta International Convention Centre in Nairobi Kenya, last weekend on the 19th and 20th of September 2015. 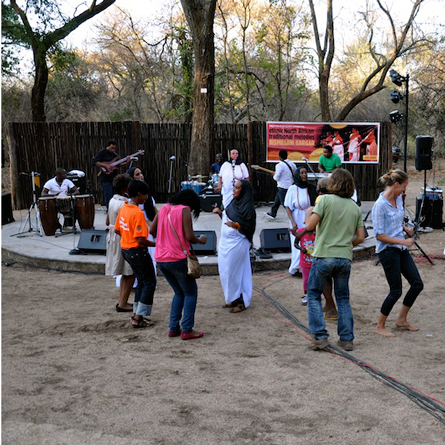 The concert coincided with the Total Motor show, which is a major motor show event in East and Central Africa. 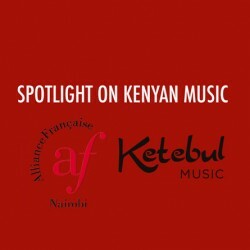 Spotlight on Kenyan Music is a cultural music programme initiated by the Alliance Française in 2005 in partnership with Ketebul Music, with the support of the Embassy of France in Kenya, Total Kenya Ltd, and the Department of Culture. 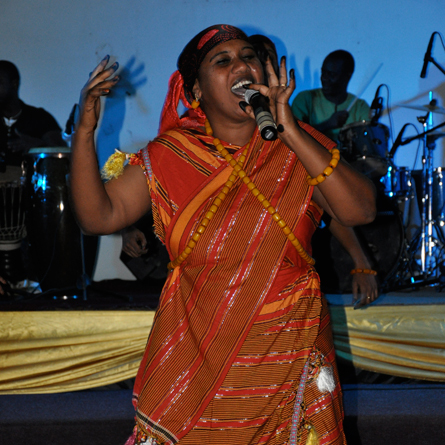 The concert featured spotlight selected Spotlight artistes such as Lelele Afrika, Juma Tutu, Makadem, Mzee Mwatela and Gargar among others. 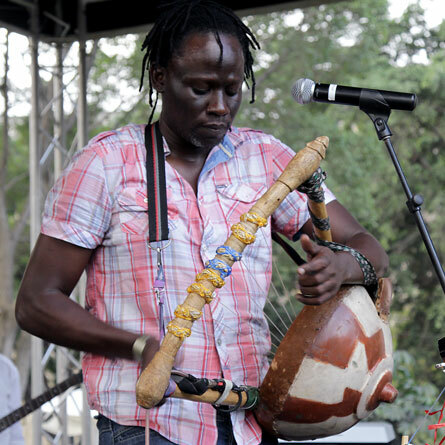 On Saturday afternoon the show kicked off with a great performance by Walter Koga, a nyatiti player from Nyakach, Nyanza. 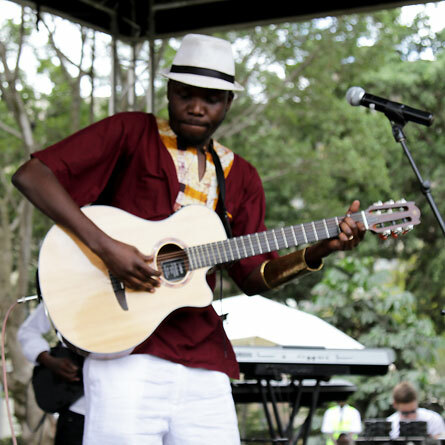 He was followed by Mutinda, who is part of the first crop of the spotlight on Kenyan music volume 1, with his song ‘Matopeni.’ His song ‘Simama’ also saw him win the International Song Writing Competition. 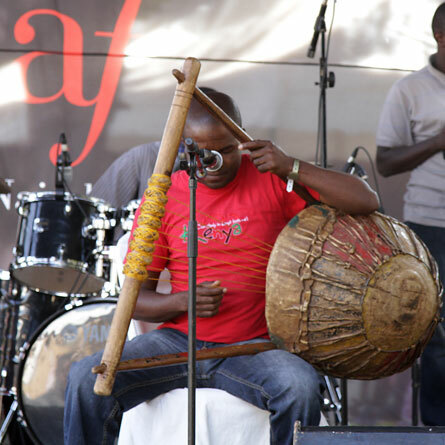 Next on line was Mzee Mwatela, a renowned percussionist hailing from the coastal town of Malindi. 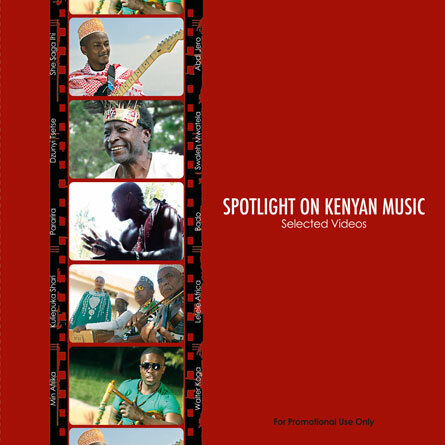 He is featured in the Spotlight On Kenyan Music volume 6 compilation. 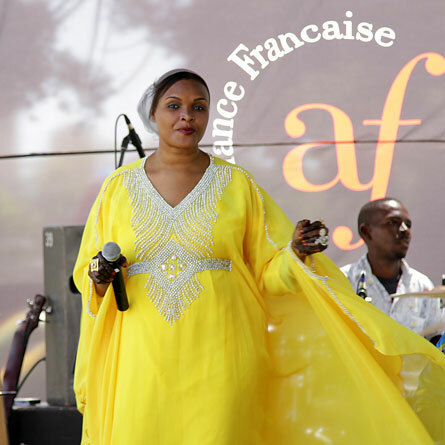 The audience was amazed by the mellow voice of Winyo who, though not a Spotlight artiste but a good friend of Alliance Française. Winyo was twice nominated for the Radio Funds International Discoveries Award and is a beneficiary of the Institut Français. 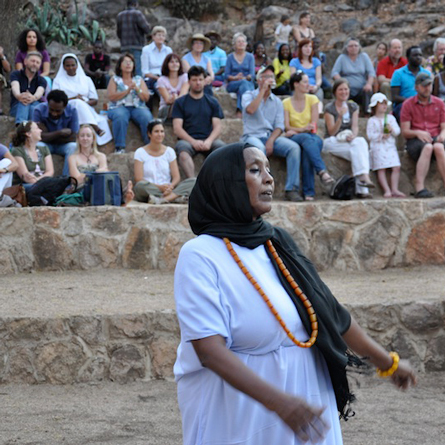 Makadem, also known as the Ohanglaman or Mganga Mkuu (the great healer) wrapped it all up with a high energy performance which had the crowd on their feet and left them yearning for more. 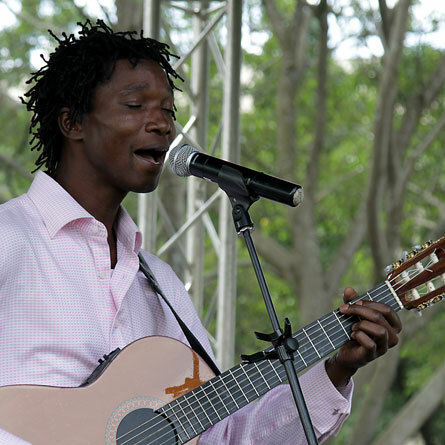 His song ‘Nyar Nairobi’ is featured in the 1st volume of the Spotlight On Kenyan Music compilation. 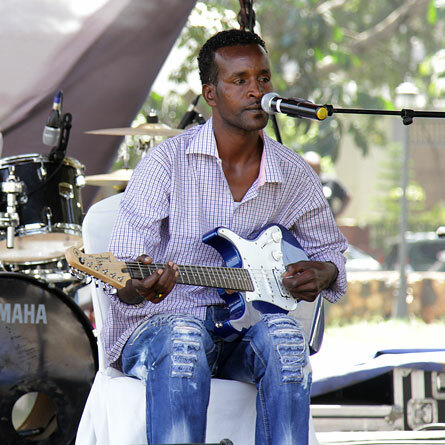 As a continuation to the celebrations, on Sunday, Mohammed Guyo from Marsabit opened the stage in style with Lelele Africa stepping in after him. Mohamed Guyo is featured in the Spotlight on Kenyan Music volume 5 compilation, which focused on music from Northern Kenya. 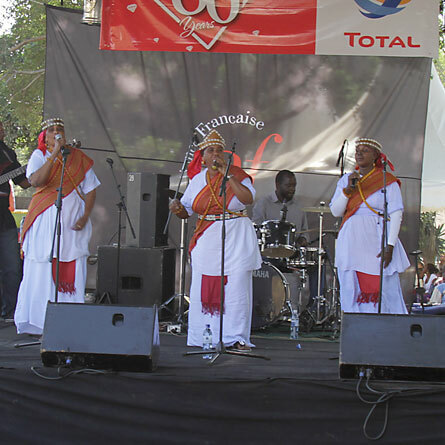 Lelele Africa is a band made up of veteran Taarab musicians and are one of the few remaining groups that still play the old style taarab music. They were featured in the volume 6 compilation. 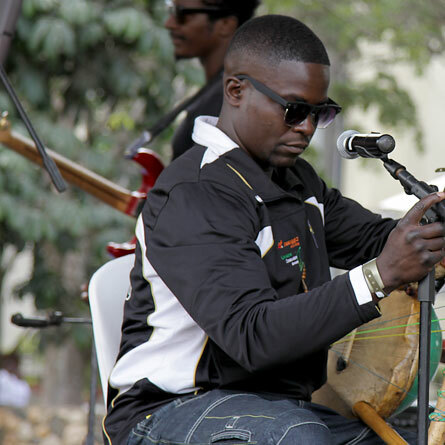 Next on stage was Chepchumba from the Rift valley, featured in the volume 3 compilation. 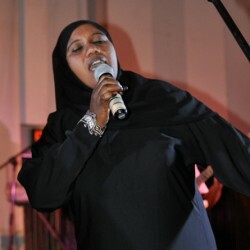 She was then followed by Juma Tutu, a Swahili jazz musician whose song titled ‘Sukari’ was featured in the volume 1 compilation, going on to become became a runaway hit in Kenya. The performances went on with Ontiri Bikundo from Kisii, whose song titled ‘Speed Governor,’ a call for responsible sexual behaviour, appears on the Spotlight On Kenyan Music volume 2 compilation. Gargar, a group made up of Kenyan women of Somali origin from Garissa, North Eastern Kenya, were next on stage after Ontiri Bikundo. 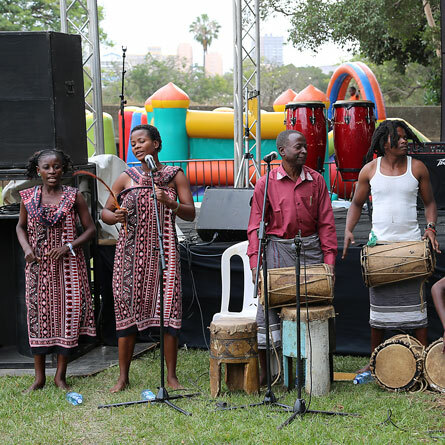 They are one of the major success stories from the Spotlight On Kenyan Music programme, having travelled to perform and showcase in numerous countries internationally. They are the only group that has been featured in two Spotlight On Kenyan Music compilations, the first being volume 4 with their song ‘Aids Wadila’ and the second ‘Shicir’ in the volume 5 compilation. Sarabi are not Spotlight on Kenyan music artistes but in an effort to support young Kenyan talent, they too were invited to perform. 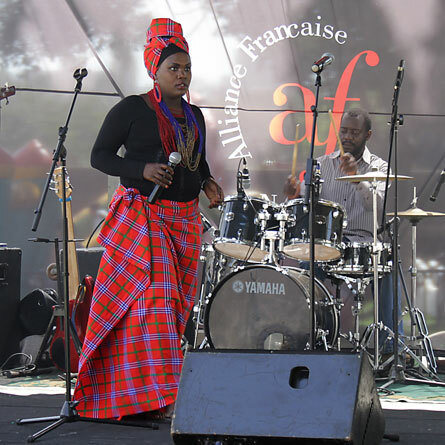 They will be performing on Friday, 24th of September 2015, at the Alliance Française gardens in a show that seeks to raise funds for their upcoming trip to Budapest where they will showcase at WOMEX. The event was also used to launch Spotlight On Kenyan Music Videos that had been shot and produced by Ketebul Music over a four month period, between May and August 2015. After breakfast, Gilmore picked Toby and I and we went over to the AF Bulawayo offices. We both wanted to catch up on some mail. Fabien came by with some worrying news. According to our itinerary, we were meant to leave Bulawayo on Tuesday afternoon by bus to arrive in Johannesburg on Wednesday morning. But due to some miscommunication, we were not being expected in Johannesburg before Thursday morning. This meant we could not depart Bulawayo on Wednesday afternoon to arrive Joburg on Thursday morning. This presented a whole new set of problems: were supposed to check out of St. Patrick’s Hotel Bulawayo on Tuesday morning, and the bus we were booked into for the road trip to Joburg was only available on Tuesdays and Sundays. In short, Fabien had to find us a place to sleep on Tuesday evening and a bus to Joburg on Wednesday afternoon! He was clearly stressed, but he promised to have it sorted out. He suggested we all spent Wednesday night at his place. I was skeptical when he suggested we share beds and I told him that won’t be possible. We could share rooms but not beds. Fabien assured me he would find enough beds so that no one would have to share a bed. All the same, I had a talk with the guys to prepare them psychologically just in case Fabien wasn’t able tofind enough beds for everyone. After lunch at Papa’s, we took the short walk to Rainbow Hotel, the venue for the nights show, for set up and sound check. The sound crew was the same from the Hillside Dams gig. They hadn’t finished setting up, so once again we sent the ladies back to the hotel and then went off for a walk in town as the crew finished setting up. We came back to the venue an hour at 5.00pm later to find them running a line check. Half an hour later they were done and we did a quick sound check and headed back to the hotel to rest before the show that evening. We were back at the Rainbow Hotel at half seven (7.30pm). 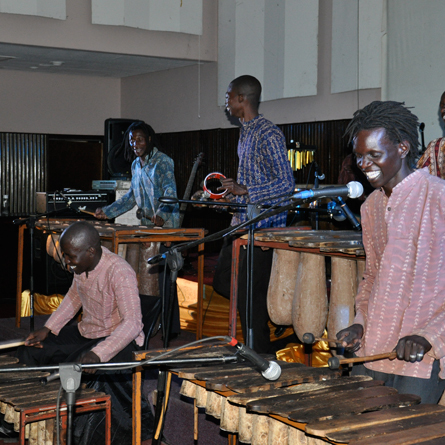 The other act of the day, Rainbow Marimba Group, was still on stage winding up on their set. They were a pretty impressive group, playing popular tunes only on the marimbas. The ladies, who had been taken to their dressing room by Gilmore as soon as we got there, came over to the hall dressed in some very intricate red costumes that had everyone gasping. I could hear murmurs from the audience as they pointed at Gargar, clearly impressed by their look. We had planned the show a little different this evening. We would break into two sets of 4 songs each. After the first set, Rainbow Marimba would come back for their second set followed by Gargar for their second set. Luli was on fire this evening. She took to the dance floor from the first song, walking into the audience calling on them to join her on the dance floor. 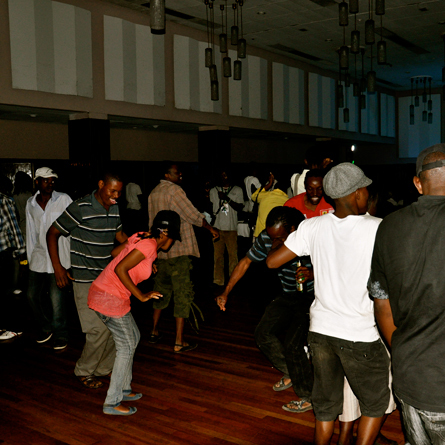 There was a large attendance by campus students who danced all through the set. For their second set, Gargar changed their clothes and came on stage dressed in traditional Islamic black dresses called ‘buibui.’ Once again they worked the audience into a frenzy especially with their last song, the funk oriented Sar, which had so far been the audience’s favorite in all the shows. The standing ovation from the audience when Gargar stepped off stage was very touching, and Luli was clearly moved by the feeling of appreciation. The same cycle repeated itself back at the hotel after the show, everyone else went off to bed, while Shady, Erico, and I whiled away the hours watching TV and drinking beer supplied to us courtesy of Fabien. The following morning, Fabien showed up at the hotel just after breakfast. He asked me to accompany him to Hillside Dams and go over the technical details with the sound crew. The Hillside Dams was a very scenic set in the more affluent side of Bulawayo. 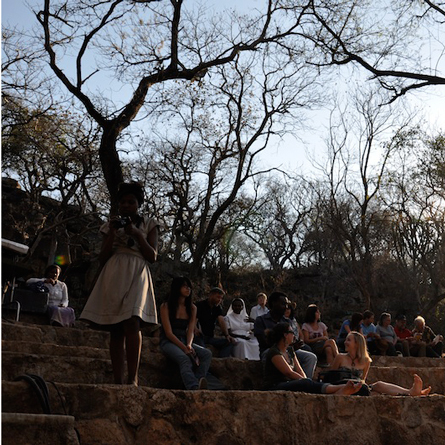 It was a park with a dam in it and the stage was overlooking an amphitheatre curved out in the rocks. The sound crew had followed my technical rider to the letter, including monitors and how they were configured and they also included side fills. Very impressive. Fabien was concerned that everything was to our satisfaction before he took me back to the hotel. This was going to be a family show and was set for 4pm that afternoon. Gilmore came by later at 12.30pm or half twelve as they say in Zimbabwe, and took us to Papa’s for lunch. Papa’s was a nice diner, which reminded me a lot of restaurants in Stone Town Zanzibar: it had an Arab-Swahili look about it. As we had lunch, which ranged from sadza (Zimbzbwe’s version of East Africa’s ugali), rice, chips and a range of curries, Gilmore and I went over plans for the rest of the day. We were already short on time seeing as we had to have lunch, go back to the hotel for our gear, go to Hillside Dams for sound check, then back to the hotel for dressing up and finally back to the Dams fro the gig, all in a space of 3hours. We came up with the perfect solution: after lunch, we would all go back to the hotel where the guys will all get ready and pick up their gear and head off to Hillside Dams for set up, sound check, and the show in the afternoon. The ladies would be left behind at the hotel where they would clean up and get dressed for the show. The guys will be dropped off at the Dams and the ladies would be picked up an hour later when everything was ready for the show. Even though we tried our best and had everything ready as fast as we could, we were an hour late to start the show at 5.00pm. 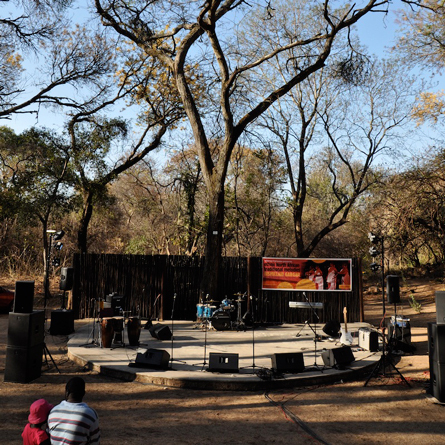 The turnout was around 120 people, which according to Gilmore wasn’t bad for a ‘Makiwa’ (the Ndebele slang for white folks) audience. As always, Gargar gave a stellar performance and had everyone up on their feet dancing with them at their last number. After the show, people flocked at the backstage area clamoring for pictures with the ladies who were by now getting used to all the attention they were drawing and were happy to oblige. Frustration creeped in amongst the ranks later when we had to wait for an hour for our transportation back to the hotel. Gilmore was at pains to explain the delay was because they had approximated the show would end much later than it did, thus they had asked the driver to come by an hour later. We tried our best to while away the time swapping stories and jokes with the ladies who had by now fully opened up to us. We went straight from Hillside Dams to Papa’s for diner. We didn’t have long to wait for our food as we had placed our orders for diner over lunch. Back at the hotel after diner, everyone else apart from Gilmore, Shady, Erico and I opted to retire for the night. It was pretty obvious now that Erico, Shady and I were the outgoing ones in the bunch. Gilmore told us there might be a nightspot or two worth visiting for a drink that night, and we were only too glad to go for the excursion. We took a short walk into Bulawayo CBD to a place called Ayoba where we met one of the memorable characters of this tour. Babongile was Gilmore’s friend and the owner of Ayoba, one hell of a crazy dude. He immediately made it his duty to entertain us, his Kenyan ‘brothers’ as he introduced as to all his friends. A few drinks down the line and Babongile suggested we go to another club that he runs in the other side of town. A few drinks later at the spot and we were all finally giving in to sleep. We finally gave in to the weariness and called it a night.